Technology often gets a bad rap when it comes to kids. Sure, parents should be invested in how their kids are using it and monitor accordingly, but tech can be educational, fun and useful for kids. Take the Amazon Echo Dot Kids Edition. Your child won’t be able to get enough of the fun games and stories that comes with a FreeTime Unlimited subscription. You can even use it to your advantage when it comes to kid-friendly entertainment and early learning programs. Here’s why every parent of a young child would enjoy an Echo Dot Kids Edition. Need to get a few chores done but want to say “I love you” from another room? With compatible Echo devices, you can use Drop-in as a two-way intercom or Announcements as a one-way intercom. It’s also great when your kid keeps saying “five more minutes,” and you don’t want to have to run back up the stairs. The Chompers skill tells jokes, plays music and offers up facts about the importance of brushing teeth while your child gets familiar with the routine of you brushing their teeth, which sounds way more fun than setting a two-minute egg timer. Just say, “Alexa, open Sleep Sounds” and your kids will be treated to rain, fan sounds and other ambient noise for a set period of time (or on a loop!) to help your child sleep through the night or go down for a nap. The Amazon Echo Kids Edition offers hands-free, kid-friendly music. With FreeTime Unlimited and built-in parental controls, you can automatically filter music with kids in mind on Amazon Music and Spotify. Try the “Magic Word” feature when using FreeTime Unlimited. When kids make their requests using “please,” Alexa thanks them for asking nicely. Sesame Street has a whole new audience. Just say, “Alexa, ask Sesame Street to call Elmo,” and kids can learn about the letter of the day or play hide-and-seek with their favorite red monster. 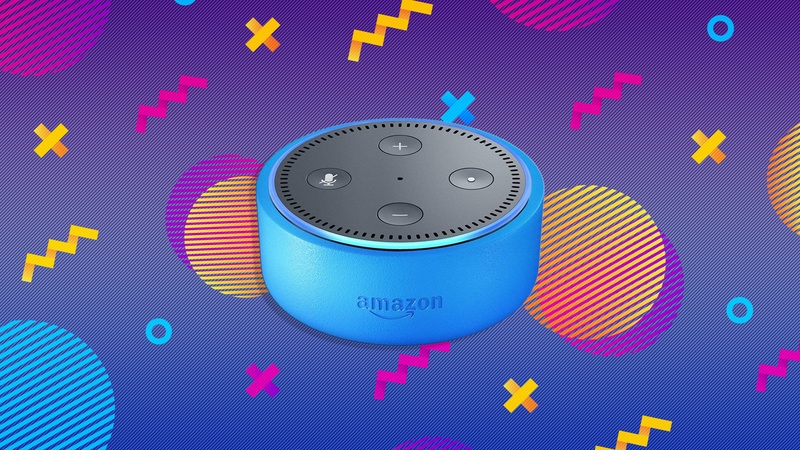 If you purchase the Echo Dot Kids Edition, you get a year of the FreeTime Unlimited, which includes more than 300 Audible audiobooks and ad-free, kid-friendly radio stations. There’s also the Amazon Storytime skill, which has a collection of professionally narrated stories. Do your kids try to stay up all night chatting with Alexa? FreeTime lets you configure a time that Alexa stops responding so kids will go to bed.